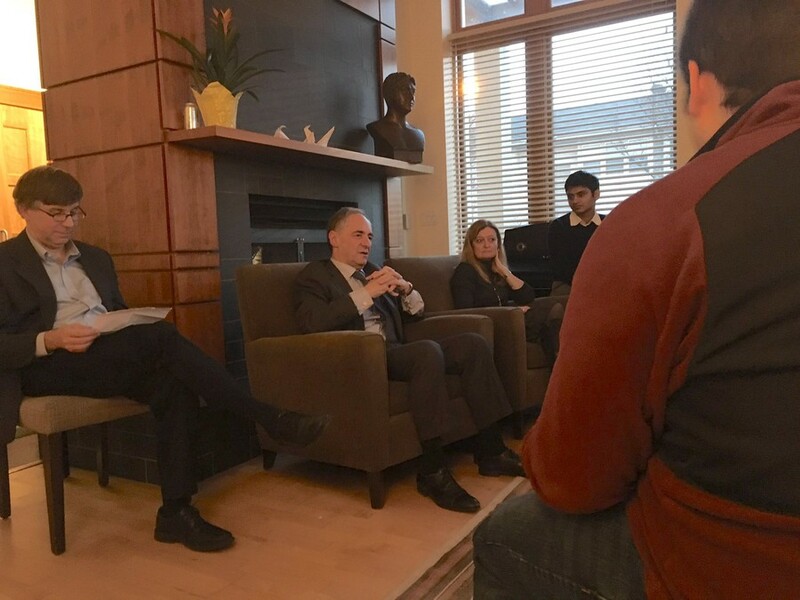 Zimmer meets privately each quarter with the Executive Committee of Student Government to discuss campus issues, while CC meetings are open to the public and press. President Zimmer talked with students in Renee Granville-Grossman Residential Commons last week. In response to an invitation sent to President Robert J. Zimmer inviting him to speak about free speech at College Council (CC), the University said in a statement to The Maroon that there would be time for dialogue at Zimmer’s regular meeting with the Executive Committee. Thirteen members of CC—none of whom are on the Executive Committee—penned a public invitation to Zimmer to speak at CC on March 2 following his February 20 Wall Street Journal interview in which he stated that it would be “fine” for white nationalist and alum Richard Spencer to speak on campus if invited. The Maroon asked University spokesperson Jeremy Manier if Zimmer has considered the invitation, and if he plans to accept it. “As you probably know, President Zimmer meets regularly with the Executive Committee of Student Government, which includes the chair of College Council. There should be opportunities for dialogue at these meetings around the University’s longstanding commitment to the principle of freedom of expression,” Manier wrote in an e-mail. Zimmer meets nearly every quarter with the Executive Committee of Student Government to discuss campus issues in a meeting. These meetings are closed to the public, while CC meetings are open to the public and press. Third-year CC representative Chase Harrison was the primary author of the letter. “Zimmer’s meetings with Executive Committee are in private. Seeing as Zimmer has felt so comfortable speaking to the press on free speech, he should feel comfortable speaking about it in a public setting on campus. I am asking Zimmer to respect his own stated commitment to open discourse by giving students the opportunity to ask questions and express concerns,” Harrison wrote to The Maroon about the University’s statement.